Audit checks are a true burden for many IT departments: Preparing reports requires significant resources and time. In addition to reports on changes, auditors also commonly require you to present Group Policy documentation that includes all objects and their settings, in order to verify that all the necessary security controls are implemented. Responding to this request with the help of native tools requires manually putting together multiple scripts and analyzing the data each of them delivers. But you won’t be able to get snapshot reports on Group Policy configurations from any particular point in the past for an auditor to compare to the current configuration. Netwrix Auditor for Active Directory facilitates efficient Group Policy documentation by offering a reliable reporting tool to help you excel at your next compliance audit. 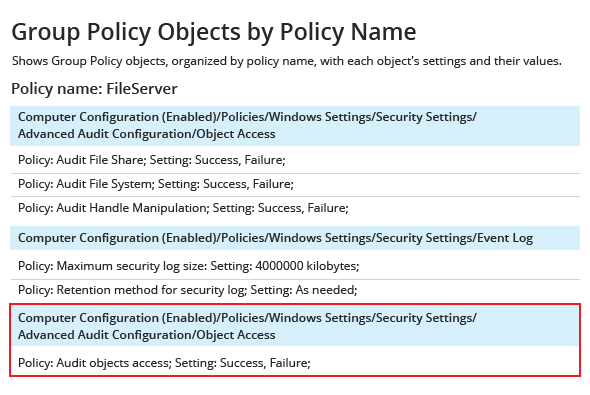 With its snapshot reporting, you can easily compare the present configuration of your Group Policy list to the configuration from a particular point in the past, and use this data at your next audit check as proof that certain security controls have been in place. 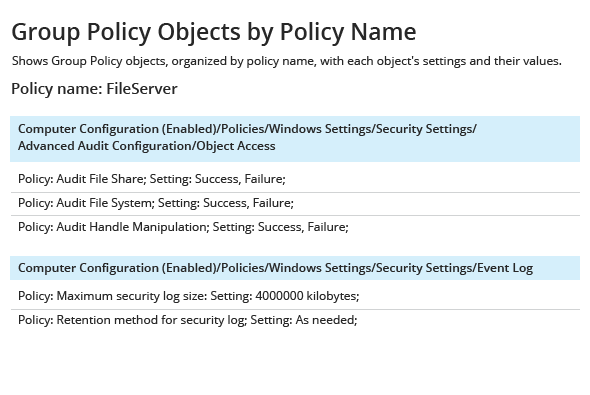 Further surpassing the built-in tools, the application also enables you to easily produce a Group Policy state-in-time report that snapshots all current settings of all Group Policies in a single view. Plus, you can subscribe yourself or your manager to these reports and have them delivered right into your mailbox according to the schedule you set.